The art scene in Glasgow is one that has grown rapidly and is now more often than not featuring on art-lovers bucket lists and almost everywhere you turn there’s some kind of arty delight waiting for you. It’s also a city that’s known for having a bit of an edge – we all know the Weegie stereotype – and a lot of the art has an edge too, with exciting artists and contemporary pieces coming out of the woodwork. Glasgow’s credentials have done nothing but grow in the art world, particularly with a few Turner Prizes under its belt – with names such as Martin Boyce and Richard Wright winning the coveted accolade. Glasgow School of Art is at the epicentre of this budding art scene, but tragically was left charred and burnt as a fire broke out and ravaged through the hallowed halls. The iconic Charles Rennie Mackintosh masterpiece was built between 1897- 1909 and was the heart of creativity in Glasgow, being a special place for many. The outpouring of grief and emotion showed just how important art is to the people of Glasgow – and a building that became an intrinsic part of the city. Alison Watt, an alumni student, described it as a “place of dreams” in the Guardian. The tears over the building were shared by students and the public alike, portraying the importance of art and the school to the life of Glasgow. It is a recognisable landmark, with original and unique features placed there by its famous architect – finishing it as a building that is a piece of artwork in itself. Admired by many it has in turn been reproduced by inspired artists and can be seen in all its glory in Glasgow School of Art by Michael Murray. Charles Rennie Mackintosh is a Glaswegian treasure and has earned a firm place in the history of art in Glasgow. He produced recognisable designs that are known all over the world while making a real impact on the architecture of Glasgow – from buildings such as The Willow Tearooms and the Scotland Street School Museum amongst many, many others. A hero of the Glasgow art scene his work has inspired and influenced years on and his particular style can be spied in Zhang Liang’s, The Glasgow School of Art. But the Glasgow School of Art isn’t the only building steeped in artistic history – the Kelvingrove Art Gallery and Museum is an institution and an iconic landmark. It opened in 1901 and has been a favourite ever since, with an amazing 8,000 item collection. 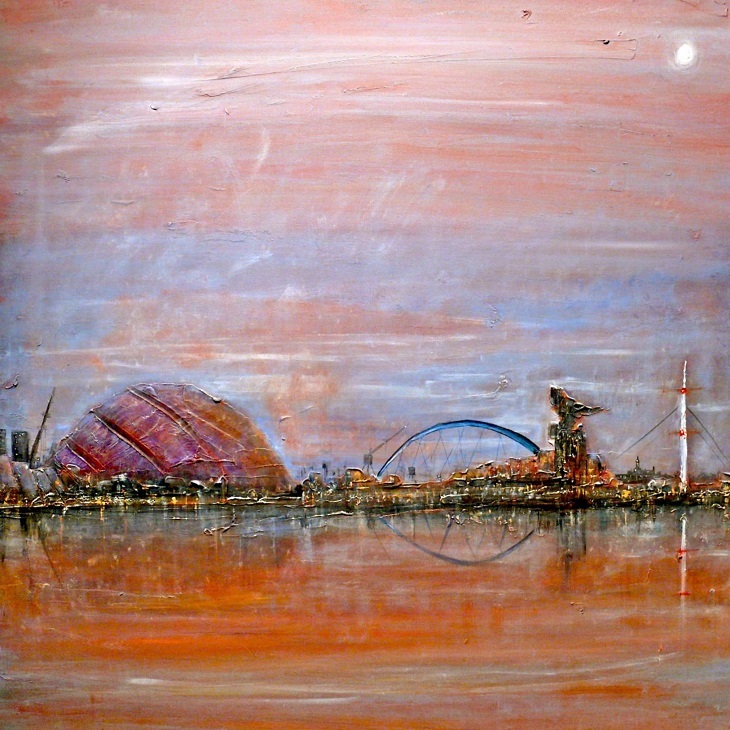 It has inspired many pieces – as a unique aspect of the Glasgow skyline – such as in Kelvingrove Museum, Sunset, Glasgow, Scotland by Andrew Peutherer. The history of Glasgow is seen in the architecture of the striking city and one building that undoubtedly stands out is the University of Glasgow. The stunning building was built in a gothic revival style – and yes you can run around pretending its Hogwarts – drawing in an array of tourists every year. The building is easily recognisable and some of the features inside – seen in Glasgow University by Lee Robertson, where the cloisters are depicted – are magical, pun intended. Perhaps not as grand, but just as recognisable are the tenements of Glasgow. Built in the 19th – 20th century out of red or blonde sandstone the blocks have a distinctive look and aren’t without their own charm. Characterised by their high ceilings and big windows, as well as ornamental details, such as decorative cornices they are enviable city flats. 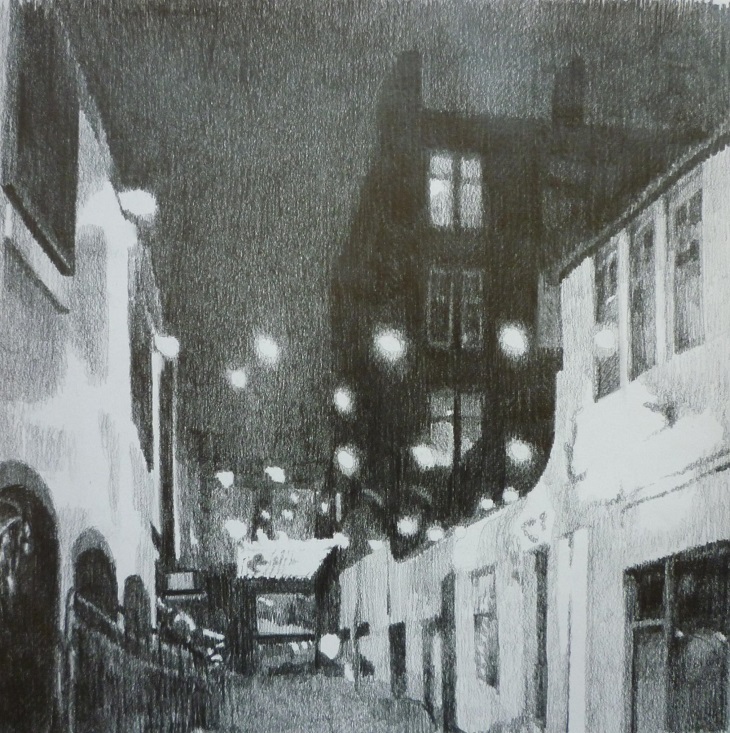 Glasgow Tenements by Michael Murray perfectly characterises the buildings with a story being told in each window – we’re all nosey neighbours after all. But, it’s not just the buildings that make Glasgow a bit of a special place, the people do too and their particular sense of humour and fun is one that is not forgotten – what other city do you know where a traffic cone and the Duke of Wellington have become local celebrities. In Glasgow’s Royal Exchange Square the Duke of Wellington is proudly stood with a cone crown precariously placed on his head – spotted in Book the Duke by Jefrus. The cone has become such a permanent feature that there was outrage and uproar when the long-hand of the law tried to raise the statue to avoid further ‘cone-age’. Supporters of ‘cone-gate’ reacted with an online petition that stated: “The cone on Wellington’s head is an iconic part of Glasgow’s heritage and means far more to the people of Glasgow and to visitors than Wellington himself ever has… does anyone really think that a raised plinth will deter drunk Glaswegians”. It looks like the cone is here to stay. It isn’t just the Duke that is shown in Jefrus’ Glaswegian collection. He depicts a delightful array of little local spots – and the more well known – in his urban, pop art, with places from Glasgow University to the Barras and Byres Road all being represented. Glasgow is filled with wee places that others might just walk past, but Glaswegians are awfy fond of, from University Cafe to a typical ‘old-man pub’, Star Bar Sopranos, all the gems of the city are shown in the collection. Even the streets can provide inspiration, with each particular point of Glasgow maybe meaning something singular to each individual. They have an air of something special around them in any weather, come rain or shine (more often than not rain in Glasgow) as seen in Ingram St by Lee Robertson and – where you’ll find us! – Cresswell Lane by Sheena Russell. And just as the more historic buildings, Kelvingrove and the Uni, provide inspiration for those on the art scene, as does the ‘more modern Glasgow’ that has emerged and can be seen on Glasgow Harbour Winter Dusk by Kevin Hunter. There’s too much to mention, as the art scene is just as sparkling as the unforgettable city itself, so why not explore both! Pop ‘Glasgow’ into the search-bar and see what you can come up with!